Given how much of Batman v Superman: Dawn of Justice is based on the 1986 comic story The Dark Knight Returns, it made sense that its author, Frank Miller, attended the movie’s red carpet premiere this past weekend. When it comes to his work at DC Comics, Miller has cemented himself as one of the most popular Batman writers of all time. It’s a good thing, then, that Batman has a big future ahead him in the DCEU, and Miller hopes to see another character, Carrie Kelley, be a part of it. Carrie Kelley would be the big one. I love my little Joker robots, and lots of other characters like his goofy sidekick, but Carrie Kelley is the one that broke my heart. 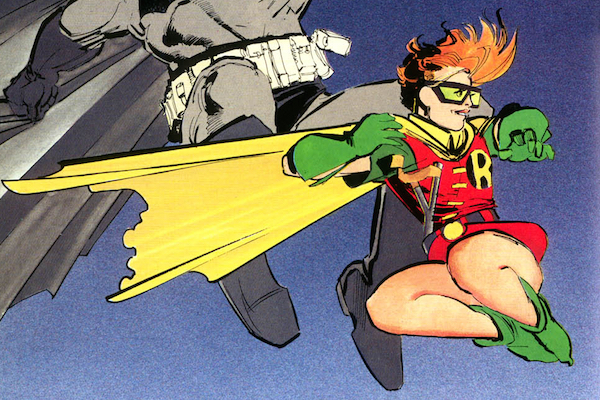 Carrie Kelley was introduced in The Dark Knight Returns as a 13-year old girl who Batman said from a gang of Mutants. Inspired by the Caped Crusader, she made her own Robin costume and managed to save him, thus earning his respect and allowing her to be his partner. Within that continuity, she was the third Robin, as Tim Drake, Stephanie Brown, and Damian Wayne hadn’t been created yet. She later became Catgirl in the 2001 follow-up, The Dark Knight Strikes Again, and she is currently appearing in The Dark Knight III: The Master Race. Carrie Keley was brought into the main DC Comics continuity in the New 52’s Batman and Robin #19 as Damian Wayne’s acting instructor. Outside of the comics, her media appearances include The New Batman Adventure’s episode "Legends of the Dark Knight," the Teen Titans Go! episode "The Best Robin," and, of course, the two-part The Dark Knight Returns animated movie, where she was voiced by Modern Family’s Ariel Winter. Of course, if she were to be included in the DCEU at some point, this would be her big debut for regular moviegoers. Back when Batman v Superman: Dawn of Justice was shooting, it was rumored that Jena Malone was playing Carrie Kelley. While director Zack Snyder is still staying mum on the matter, the most common belief is that Malone is actually Barbara Gordon, but fans we’ll have to wait until the R-rated, extended "Ultimate Edition" comes out to see who she is playing. As far as the DCEU’s Robins go, all we know for certain is that one of them met their demise at The Joker’s hands, and the common belief is that, like in the comics, it was Jason Todd. Whoever it was, Batman may be more hesitant to take a new sidekick at this stage of his life, which would make Kelley’s inclusion more difficult. Still, with a new Batman solo movie in development, maybe he’ll run into Carrie Kelley in that story and form a bond, thus granting Frank Miller his wish. Let us know in the comments if you’d like to see the Carrie Kelley Robin brought into the DCEU.